PITTSBURGH (July 3, 2018) … The back cover of Royal Society of Chemistry journal Chemical Science featured an artistic depiction of research from the laboratory of John Keith, assistant professor of chemical engineering and R.K. Mellon Faculty Fellow in Energy at the University of Pittsburgh, into a simple and effective way of modeling chemical reactions in solutions. 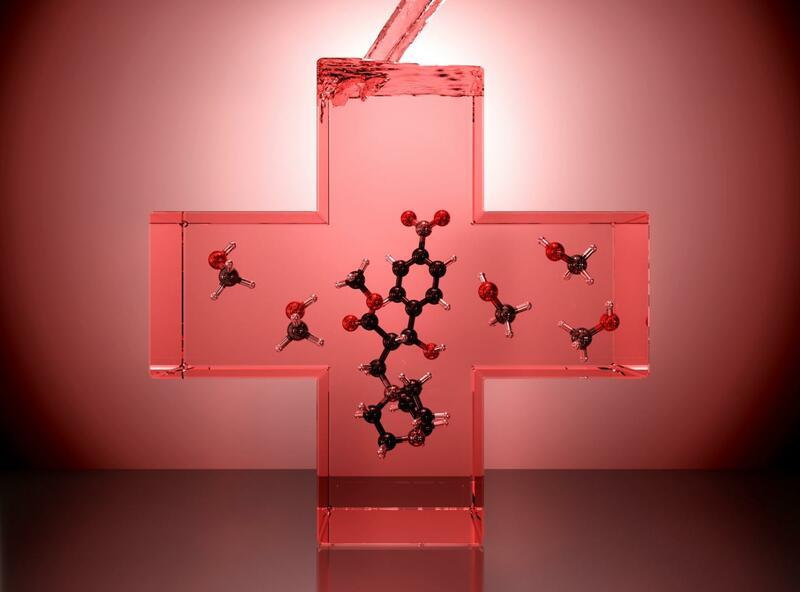 Yasemin Basdogan, a PhD student in Dr. Keith's lab, designed the back cover image, which shows several molecules reacting in a cross-shaped container slowly filling with a liquid. She says, "The red cross in the cover art symbolizes the medical red cross that you see on ambulances. Our model is like a paramedic team that comes with an ambulance: it's a quick fix that can be really effective." Their study titled "A paramedic treatment for modeling explicitly solvated chemical reaction mechanisms" (DOI: 10.1039/C8SC01424H) analyzed a very complex chemical system called the Morita-Baylis Hillman reaction. Previous modeling studies have traditionally struggled to explain subtle details of this reaction (DOIs: 10.1021/ja5111392, 10.1039/C7CP06508F), but Basdogan and Dr. Keith brought improvements to the modeling that allows better understanding of these types of chemical reactions that will impact areas of chemical engineering and chemistry. "I'm particularly interested in how characterizing chemical reactions can help improve our understanding of the human body," Basdogan explains. "By understanding catalysts working in solution we get closer to understanding how enzymes catalyze chemical reactions in your body. We need to first understand fundamental reactions before we can understand the even more complex systems." Basdogan developed the image for the back cover using tools and skills she learned in a course at the Swanson School of Engineering taught by Assistant Professor Chris Wilmer called ChE 3460 Advanced Scientific Visual Communication. The course teaches how to use modeling and animation tools such as GIMP, Inkscape, and Blender and the Python programming language to create professional quality artwork based on students' research. "This cover art was my final project for the Advanced Scientific Visual Communication class," says Basdogan. "Dr. Wilmer helped me throughout every step of the art project." "[Basdogan and Keith] showed that continuum solvent models do not describe local solvation effects very well. This can lead to mechanistic steps like proton shuttling and charge transfer being modelled poorly. As an alternative, [the researchers] developed a strategy that can be carried out by anyone with a general grasp of quantum chemistry." "'What I first thought would be 6-12 months of work ended up being far more challenging. Fortunately, I had a very talented 1st year PhD student, Yasemin Basdogan, who stayed focused and never quit on the project – or me!,' says Keith." "Basdogan adds, "This manuscript is my sixth publication, but it has a special place in my heart because it is the first work that I completed mostly myself in the Keith Group, and I learned a lot of things along the way." Basdogan is now in her third year as a PhD student. She said she would like to stay in academia after completing her PhD to become a professor.